Jennifer Abbott first arrived at Wabash College in 2002, fresh from her graduate studies at The Pennsylvania State University. Broadly speaking, Prof. Abbott examines how visual and verbal symbols attempt to influence our perceptions, attitudes, and even actions. She is particularly interested in how popular media portray gender and how the news media employ language and imagery in their publications and broadcasts. In addition, she has taken a more recent interest in exploring the relationships between rhetoric, citizenship, and democracy. Prof. Abbott is an Associate Professor and is currently chairing the Rhetoric Department. 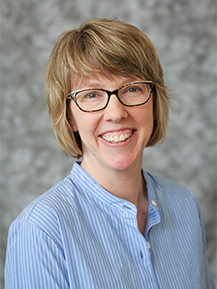 In her spare time, Prof. Abbott enjoys spending time with her husband, Michael Abbott, who is also a member of the Wabash College faculty, and their daughter Zoe. They can frequently be found at Little Mexico, their favorite restaurant in Crawfordsville, when they aren’t updating their turn-of-the-century home or playing Rock Band together. "The Lessons of Yesterday's Public Journalism for Tomorrow's Citizen-Engaged Journalism." Communication and the Future Division Top Papers. National Communication Association Annual Convention, Philadelphia, PA, 2016. "Rhetoric, Deliberation, and Civic Engagement in the Public Speaking Course." Panel Submission. National Communication Association Annual Convention, Washington, D.C., 2013. “Public Speaking and Civic Engagement.” Presented at the mini-conference: “Bridging Differences with our Common Traditions: Public Speaking and Public Address in the Twenty-First Century.” National Communication Association National Convention, San Francisco, CA, 2010. “Objectivity and Bias in the News: A Comparison of Mainstream, Religious, and Political Opinion Presses.” Social Construction Division. National Communication Association Annual Convention, Chicago. 2007. “What About the Alternative Press? : The Role of Religious and Political Periodicals in Democratic Citizenship.” Rhetoric and Democratic Citizenship: A Colloquy in Honor of William Norwood Brigance, Wabash College, Crawfordsville, IN, 2005. “Bravery and Cowardice: News Media Gendering of the Iraq War.” Third International Conference on New Directions in the Humanities, Cambridge, England, 2005. Abbott, Jennifer Young, Todd F. McDorman, David M. Timmerman, and Jill Lamberton. Public Speaking and Democratic Participation: Speech, Deliberation, and Analysis in the Civic Realm. New York: Oxford University Press, 2016. “Writing the News: A Comparison of Objective, Religious, and Political Opinion Presses.” Journalism: Theory, Practice, and Criticism 12:3 (April 2011): 349-366. “The Positive Functions of ‘Negative’ Rhetoric: Feminists’ Expository Campaign Against the Promise Keepers.” Women’s Studies in Communication 30 (Spring 2007): 1-33. “Religion and Gender in the News: The Case of Promise Keepers, Feminists, and the ‘Stand in the Gap’ Rally.” Journal of Communication and Religion 29 (November 2006): 224-261. “William (Bill) Paul McCartney.” In American Voices: An Encyclopedia of Contemporary Orators. Eds Bernard K. Duffy and Richard W. Leeman. Westport, CT: Greenwood Publishing Group, 2005. 307-315. Fulmer, Hal W., and Jennifer Young Abbott. “William Franklin (Billy) Graham.” In American Voices: An Encyclopedia of Contemporary Orators. Eds Bernard K. Duffy and Richard W. Leeman. Westport, CT: Greenwood Publishing Group, 2005. 177-186. Co-Recipient of Top Paper Award from the Communication and the Future Division, National Communication Association Annual Convention, Paper title: "The Lessons of Yesterday's Public Journalism for Tomorrow's Citizen-Engaged Journalism" (2016). Recipient. Research Exchange with the Kettering Foundation. Grant focuses on researching and analyzing public journalism practices (2015-2016). Co-recipient (with Todd McDorman, Jeff Drury, Sara Drury, and Jill Lamberton). “Civic Engagement and Deliberation: Exploring a Center for Democracy and Public Discourse.” Great Lakes College Association New Directions Initiative Grant. Grant focused on hosting a Brigance Colloquy on Civic Engagement (2013-2014). Lead Writer and Co-recipient (with Todd McDorman, Jill Lamberton, and Lexie Hoerl). “An Interdisciplinary Approach to Civic Engagement.” Great Lakes College Association New Directions Initiative Grant, 2010. Grant focused on renovating RHE 101 and pairing it with PSC 111 (2010). Lilly Liberal Arts Fellow, Awarded by Center for Inquiry in the Liberal Arts, Wabash College; Fellowship focused on Public Speaking as a Liberal Art (Fall 2009). Co-recipient of Top Paper Award from the Social Construction Division, National Communication Association National Convention, Paper title: “Objectivity and Bias in the News: A Comparison of Mainstream, Religious, and Political Opinion Presses.” (Fall 2007). Cheris Kramarae Dissertation Award, Organization for the Study of Communication, Language, and Gender (Fall 2004). Co-recipient of Top Paper Award for Excellence in Competitive Papers from the Visual Communication Commission, National Communication Association National Convention. Paper title: “'Promise Keepers, Equality Bashers': NOW and the Rhetoric of Documentary Video.” (Fall 2002).